Last week Monday, February the first, Pier 60 at the Chelsea Piers in Manhattan hosted the Royal Wine Corporation’s organized the 2010 Kosher Restaurant & Wine Experience. Restaurants, a caterer, a supermarket, a salsa manufacturer presented some of their food creations while dozens of wine producers from around the world showed off their potables. In the back of the room in the photo above, behind the restaurants, between two glassed walls and directly overlooking the Hudson River Nesher Caterers (4023 13th Ave; Brooklyn, NY 11218-3501; Telephone: 718.437.3631). Their huge display sporting chairs and tables consisted of a full fare with many choices of appetizers, fish, meat, salads and desserts. The food was delicious and I walked away convinced Nesher should be a natural choice for anyone’s simcha. Pomegranate had a huge display I sampled all their meat selections, the Heimische Brisket however was among the best I ever tasted. Juicy, tender and oh, so flavorful! Abigael’s, Carlos & Gabby, China Glatt, Cho-Sen, ClubHouse Cafe, Colbeh, Dougie’s, El Gaucho Steakhouse, etc steakhouse, Fumio, Glatt A La Carte, Le Marais, Noah’s Ark, Nesher, Noi Due, Tevere. were the restaurants represented at this venue. Each eatery, offered tantalizing samples of some of their favorite dishes. I discovered some delicious salsas at My Brother Bobby’s Salsa booth, their recently introduced Bruschetta topping was superb. It’s no wonder they won so many accolades in various upstate fairs. Valerie and Robert Gropper, the owners, are a very energetic couple with an infectious – yet fully justified – enthusiasm for their excellent products. Their fresh products include: Original Red Salsa, Tropical Black Bean Salsa, Hot Tomatillo with Corn Salsa and Bruschetta topping. 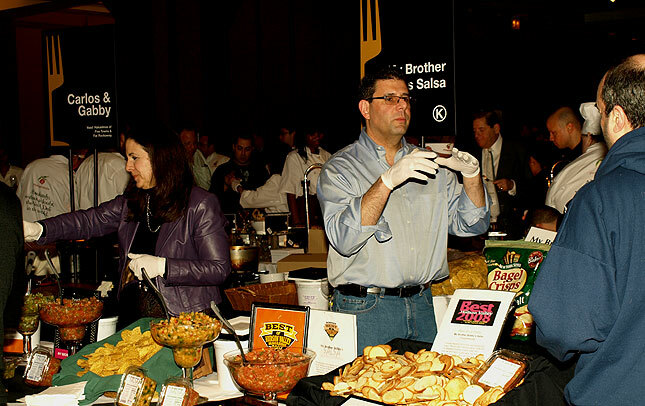 Selected “Best Bruschetta 2008” and “Best Salsa 2009” by Hudson Valley Magazine. If I can ever find these products in Brooklyn or Manhattan I’ll have to do an in-depth review. They tasted great! There were more than 200 wine selections from around the world, the French Collection by Pierre Miodovnick attracted a lot of attention. I sampled two white sweet ones, 2001 Chateau Piada and a 1999 Chateau Guiraud, made from grape from the Sauternais region of the Graves section in Bordeaux. The Chateau Piada – from Semillon grape – was sweet, luscious and full flavored, with a long, lingering finish. I could see it being served with full flavored cheeses and sweet desserts. The Chateau Guiraud was even better as it also includes some Sauvignon Blanc, which made it less sweet and more delightful to my palate. For a dry French wine I tried a 2003 Chateau Pontet-Canet Paulliac, it has an intense color, strong on the nose with blackberries, rapberries well balanced with liquorice and other wooden tones. It’s made up of 65% Cabernet Sauvignon, 30% Merlot, 4% Cabernet Franc, and 1% Petit Verdot. This one will certainly occupy a place of honor in the pantheon of the best wines I’ve ever tasted! There were some Israeli wines that I also liked, notably a 2006 Petit Castel, 2006 Yatir Cabernet Sauvignon (quite fruity and with subtle vanilla tones), Alexander Gaston Reserve (40% Cabernet Sauvignon, 30% Merlot, 30% Shiraz), the 2006 Alexander Syrah (90% Syrah, 10% Cabernet Sauvignon) and, of course, my all time favorite Israeli wine… 2005 Benyamina The Cave! Before leaving I attended a session by Pierre Miodovnick where he explained about the great wine producing chateaus and their wines. After him, Jay Buchsbaum explained some wine terms and how to read a wine label. This event proved informative and delicious, I can barely wait until next year!